CWS Polytank Stands: Cement or Metal? Amin checks the water level of the polytank. This is a typical CWS water treatment center with cement stand. Wahab checks the water levels of the polytank in Gariezegu. This is a center that uses a metal stand. While preparations for the summer fellowship program are underway, we’re still focused on monitoring at the CWS Tamale office until the fellows get here. Tamale is in between seasons. It has been raining but the rainy season is not in full swing just yet. The CWS field staff is prepping our 49 villages for the seasonal transitions that will take place during the fellowship program when they will be given less attention. Full time field staffer, Amin, will be monitoring the communities while the other field staff will be working as translators for the fellows. One way we’re prepping the communities is by bringing the entrepreneurs metal polytank stands. If you read my post on building polytank stands a few months ago, then you already have an idea of what I’m talking about. Several CWS partnership communities drink from multiple water sources throughout the year. 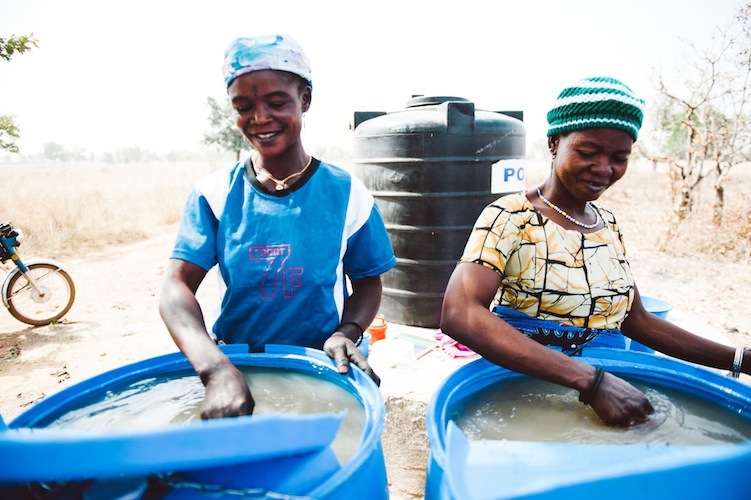 As the rains come, the women, who are responsible for collecting water in the Dagomba culture, opt for fetching water from water sources that are closer to home. In some villages that might mean going to a closer dugout that only fills with water when it rains. In others, it might mean drinking from hand dug wells in the community or drinking from a stream that is created during the rainy season. 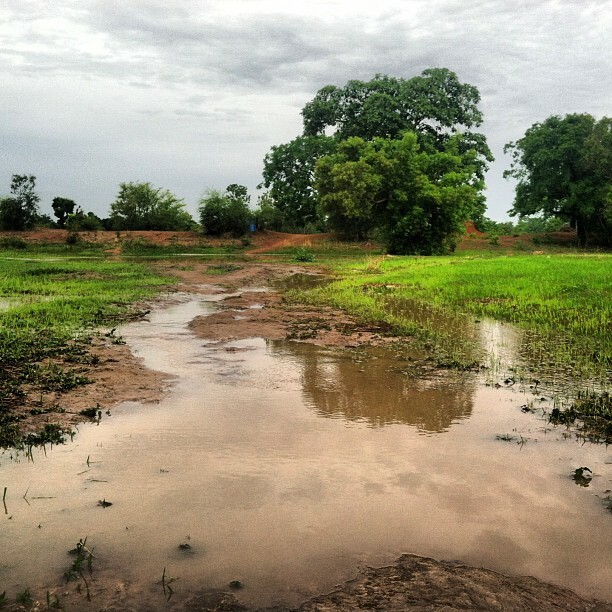 The path to Gariezegu’s center floods when the rains start, which is why the community now uses a metal polytank stand to bring their center to town. 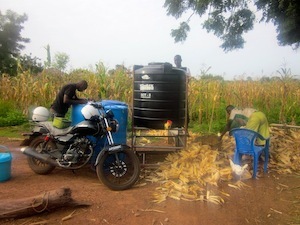 The entrepreneurs treat and sell well water and rainwater throughout the rainy season. The metal polytank in Gariezegu that inspired the new CWS metal polytank stand! We’re realizing on the monitoring side that this is a common trend and that we need to have realistic expectations for the entrepreneurs running the centers. It would be hard for the women to treat and sell water at a dugout where the path is flooded and where nobody goes to get water for three months out of the year. Initially, CWS planned on building cement polytank stands at the various locations from which people collect water. 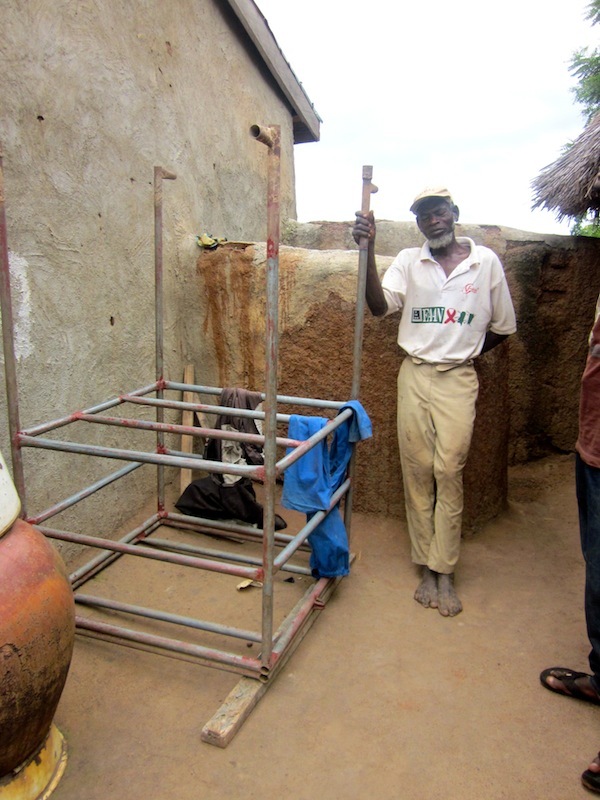 But we were inspired by the metal polytank stand that Gariezegu used last rainy season to bring their water treatment center to town to treat well water. The metal stand can be moved around, which is ideal for villages that collect water from different sources. 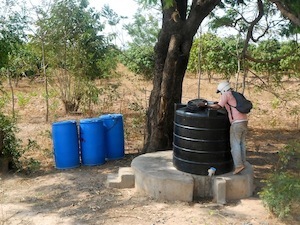 Instead of building multiple stands, the community can move their center to wherever it is they are getting water. West Africa Reginal Director, Kathryn Padget, and Project Manager, Peter Biyam, got in touch with a welder and showed him a diagram of what the metal polytank stand should look like. The welder was able to make the polytank stand out of metal piping and so the metal stand was created! CWS entrepreneur, Anatu, stands with Kpanayili’s new metal polytank stand located next to their closer dugout that is only full of water during the rainy season. CWS does not anticipate using these metal stands in every community or using these stands first thing in implementation. The cement polytank stands are a good fit for communities that only drink from one water source year round because they are so durable and because they can’t be moved! 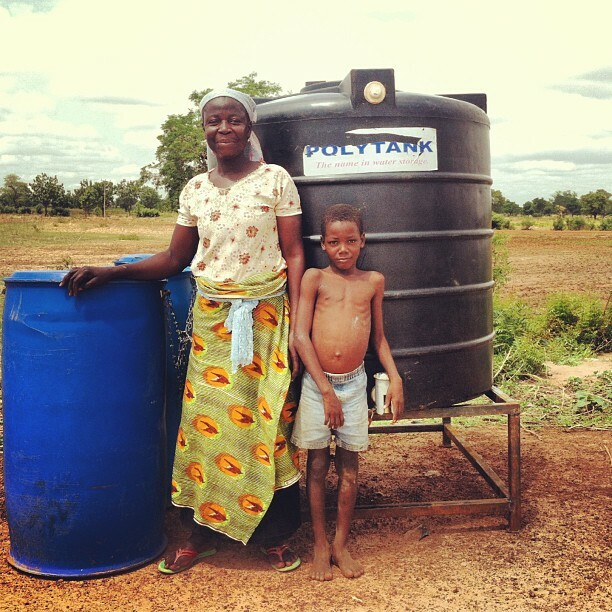 The metal polytank stands will only be added to communities that will need to move their centers to other water points. So far, CWS has brought metal stands to Gbandu and Kpanayili. We are hoping to get metal stands out to Libi, Tindan II, Kpalbusi, Jarayili and Tacpuli before the fellowship program. As of now, we’re just waiting on the welder!